All About House Rabbit ConnectionHouse Rabbit Connection, Inc.
Who are We and Why are We Here?! is a 501(c)(3) nonprofit organization. HRC was founded by a committed group of individuals dedicated to the plight of abandoned rabbits. The organization now has about 105 members in 14 states. You can also find us on social media through Facebook, Twitter, and Instagram. We are an official Chapter of the worldwide House Rabbit Society for Connecticut and Massachusetts in the United States of America. HRC is made up entirely of volunteers — individuals who dedicate time, money, and energy to move HRC toward its goals. These individuals share a love of rabbits and the belief that rabbits should not be relegated to hutches in the backyard. Instead, rabbits should be inside the home, free to explore rabbit-proofed room, living in roomy cages (or cage-free), playing with toys, and interacting with all members of the household (human and non-human). * This website, the telephone HopLine (413/525-9222) and email. * Facebook, Twitter and Instagram. Why does the world need rabbit rescue groups? Rabbits are a growing pet population in the United States and around the world; however, many people who purchase rabbits do not know the time and training involved in having a great pet and animal companion. People buy cute little bunnies for their children without realizing this animal will need care and attention for at least ten years. 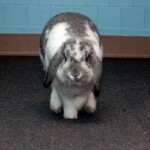 As a result, these rabbits are abandoned in shelters, parks, and even woodland areas. Domesticated rabbits have very little chance for survival in the wilderness and most rabbits dropped off at shelters are euthanized. YOU CAN CHANGE THIS TERRIBLE TREND! The House Rabbit Connection, Inc. is non-profit organization that is committed to changing this trend forever. Donations and volunteers are a critical part of the organization. Without either, we would not be able to save rabbits, adopt them out to loving families, and offer information to the public. Donations are always needed. The money donated will go to spaying and neutering rabbits adopted from shelters, educating the public about rabbit ownership and rabbits in general, as well as many other programs sponsored by the House Rabbit Connection. HRC is run by an all volunteer Board of Directors. The Board members are elected at HRCs annual meeting in June and serve for 3 years between elections. On any given year approximately 1/3 of the board seats are up for election. All of the work that HRC does is channeled through volunteer committees. And each committee is chaired by a member of the board. Please consider joining us as an Educator. The Organization may cooperate with other individuals and groups having similar goals, philosophies, and concerns. We cannot and do not take rabbits from the public. It would really help you and us if you read the following articles before contacting us.